HIGH FLOW portable fire extinguishers for applications where discharge rates exceeding one pound per second are required as specified in NFPA 10. 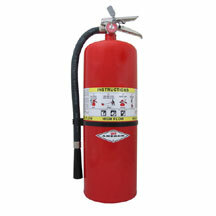 These extinguishers utilize the same hard ware and are manufactured to the same U.L. specifications as Amerex compliance rated products.